We recommend you get the DVD - same price as a download - unless you really can't wait 2 to 3 weeks or unless you are in one of the Pacific Islands where we can't mail the DVD to you. If your computer does not have a DVD player you can use another computer that does have a DVD drive and transfer the files from the DVD to a USB drive to install the guides on your computer. If you are in New Caledonia you can get the DVD from Noumea Ocean - at Port Sud Marina in Noumea. Call Chloe first to arrange a meeting. Her phone number and a google map showing her location are on her website www.noumeaocean.com. 1. INSTALL A DOWNLOAD MANAGER PROGRAM. Due to the very large size of these files you must use a download manager program to avoid problems with the download. A download manager speeds up the download (often by 400%), assures the files are completely downloaded and can check their integrity. If there is a brief server-interrupt during the download (and there is a very good chance of this) the download manager will resume the download without a problem. You'll be glad to have the download manager next time you go to download something from the Internet. So, before you start the download, go to Freedownloadmanager.org and download and install this excellent, free program. 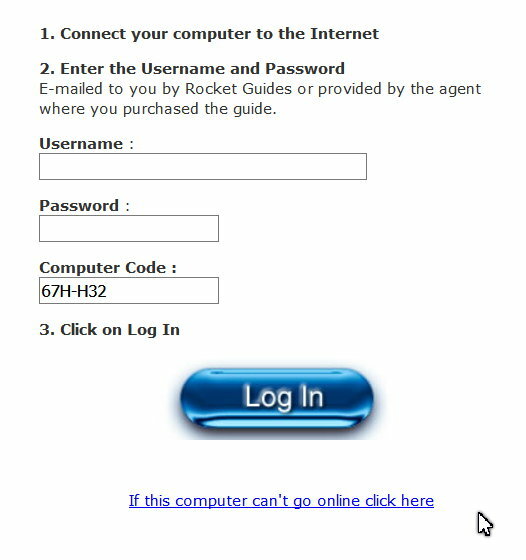 An email is also sent to you from rocket-guides.com with the same information and links, detailed download and installation instructions and your password and username to log in to the activation center. 1. First download and install the download manager. 2. Open the email from rocket-guides.com with the installation instructions. If you did not get one after your purchase check your spam box or use the contact form to email us and we will send it again. 3. Right click on the link in the email and select "copy link address"
4. Open the download manager and select the "Add Download" icon. The download manager will pop up a small window showing the download and where it will be saved on your computer. Click OK. When the download is finished click on the folder icon and double click on the installation file. Most people download files of 10MB to 50MB and browsers can usually handle that sized file OK. But when you want to download a really big file - over 100MB - the browser download process can, and often does, fail. This is because during the time it takes to download a big file your connection to the server can be interrupted - either by something your computer decides to do or by one of the multitude of connections between your computer and where the file is stored on a server. Our guides are very big files - 400 to 500MB - and the chances are that you'll have at least one interruption during the time it takes to download them. So the part that does download won't work and you'll need to start over again - and again. 2. Open the email from ncvan.us with the installation instructions. If you did not get one after your purchase check your spam box or use the contact form to email us and we will send it again. Your computer probably went to sleep because nobody was using it. To do this, enter Power in the search box on the task bar - or click start and enter Power in the search box - select Power and Sleep Settings. Set all the sleep settings to never (never dim the display, never turn off the display and never put the computer to sleep when it is plugged in). You can change it back to whatever you'd like after the downloads are finished. If the speed drops to zero and stays there for more than 10 seconds make sure you are still connected to the internet and, if not, fix the internet connection problem as quickly as you can. If the Freedownloadmanager does not automatically begin showing the download speed again, click on the pause button then, after that changes to a play icon, click the play icon to resume the download. The cruising guide must be activated for the computer you intend to use it on while cruising. It will only be activated on one computer unless you purchase a second license. 1. Open the email from Rocket-Guides.com with the username and password you'll need to activate the guide. 2. Be sure your computer is connected to the Internet. 3. Suspend your antivirus program and firewall for 15 minutes. 4. Double click on the INSTALL-CRUISING-NEWCALEDONIA.EXE file. Windows may warn you that the application is not a recognized app and prevent it from running. Click on the "more info" link in the warning window and then click on "run anyway" - Windows may then ask if you want to run the program (duh) click OK and follow the installation wizard. 5. The first time the cruising guide starts you will be notified that an activation key is required. Click OK and a registration window will appear. Enter the username and password provided by email when you purchased the guide or provided by the dealer when you purchased the guide. Click on the blue LOG IN button in the registration window. (Note: The computer code is filled in automatically). IMPORTANT: Only click ONCE and wait. 6. There may be a brief delay and you'll see your username and activation key. Then just click on the ACTIVATE button and the guide will be activated. If you did not get the email, use this contact link to send an email asking for another email. Be aware that the only authorized sales agents are: Boat Books Australia, Boat Books New Zealand, Noumea Ocean, Noumea Yacht Services, the Island Cruising Association, and the Down Under Rally. This is complicated. If there is any way your crusing computer can go online do it that way. If your cruising computer really can't access the Internet you can get the activation key from another computer that can go online (eg from an Internet Cafe, smart phone or tablet) . 2. Start the cruising guide program and when the registration window appears, click on the "this computer can't go online" link under the normal login form. 3. Highlight and copy the hardware code (it will look something like 653C-6409). Paste this into the text file. 4. Type the activation website address you see there and paste it into the text file. 6. Open the txt file on a computer that can go on the Internet. 7. Go to the website url you copied from the registration window and log in using your username, hardware code and password. 8. The activation process will send your username and activation key to your email address. 9. You can also highlight and copy the activation key and paste it into your text file then save it back to the USB drive. 11. Start the guide, click on the can't go online link, and paste the activation key in the appropriate text box. Enter your username then click Enter Key. Or, log in to your online members account page using the login link in the support menu above where you'll see the same information and link. On the menu bar above Click on Support/Member Login and enter your username and password to go to your members account page and see your activation information, order a second license, or order a DVD or download of the latest version of the guide. Open the control panel on your computer and select Programs and Features. Or enter Programs in the search box on the task bar and select Programs and Features. Scroll down to find Cruising New Caledonia The listing for the cruising guide gives the version number (month and year of publication). If the version of your guide is dated after May 2012 (check the version number as described above or check the date of NEWCALCRUISING.exe in the C:/Program Files (x86)/Cruising New Caledonia\ folder) select Support/Member Login on the menu bar and then click on Your Account/update. We no longer support versions of the guide dated prior to May 2012. If your version is prior to May 1012 click here to purchase a new license. I activated the guide but I get a message that it needs to be activated again. More than likely your Antivirus is to blame. It is blocking the guide from registering the activation key by running the program in a "sandbox". 1. Right click on the icon for your anti-virus and open the program's window. If your antivirus (like Avast) has a "sandbox" feature you need to exempt NEWCALCRUISING.exe from being run in a sandbox. Then suspend your Antivirus protection for 20 minutes while you activate the guide again. 2. Log into your members page using the login link on the support menu above, highlight and copy the activation key you see there. 3. Right click on on the cruising guide icon NEWCALCRUISING.exe and select "run as administrator". When the registration box opens click on the "can't go online" link under the big blue button and paste in the activation key. Enter your username and click OK. I installed the guide but now nothing happens when I try to start it. Your antivirus has quarantined or deleted NEWCALCRUISING.exe. 1. Check in C:/Program Files (x86)/Cruising New Caledonia and see if the file NEWCALCRUISING.exe is still there. 2. If NEWCALCRUISING.exe is NOT in the Cruising New Caledonia folder your Antivirus has either deleted or quarantined it. ALL good antivirus programs let you designate a file as an exclusion so it can be removed from quarantine and allowed to run. 3. You'll need to suspend your anitvirus program and reinstall the program from the INSTALL-WINDOWS-NEWCALEDONIA-CRUISING.exe file. 4. Search on Google for the name of your antivirus program and "how to exclude a program"
Then follow the process to exclude or whitelist c:\program Files (x86)\Cruising New Caledonia\NEWCALCRUSING.exe. For example, if you are using Kasperky, here is a an excellent video tutorial. For a tutorial on how to set up exclusions on Avast click here. For WebRoot follow these instructions. If you have an antivirus program that will not let you exclude a program then I strongly suggest you get another (better) antivirus program like my own personal favorite Malwarebytes Premium). I installed the guide but Windows gives an error message when I try to start it. Or the error might say the app is not a valid 32bit windows program. Windows 10S was designed for schools to keep students from downloading unapproved apps on the school's computers. 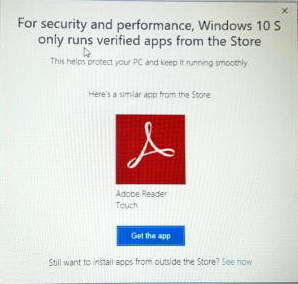 It only runs "approved" apps downloaded from the Windows store. To run other apps you need to upgrade to Windows 10 Pro, change the installing apps setting to allow apps from anywhere, and reboot. If you are not sure if your computer is running Windows 10S, open Windows Explorer by clicking the windows key and E, select This PC, click on the Computer tab on the top of the window, then click on System Properties to see your version of Windows. 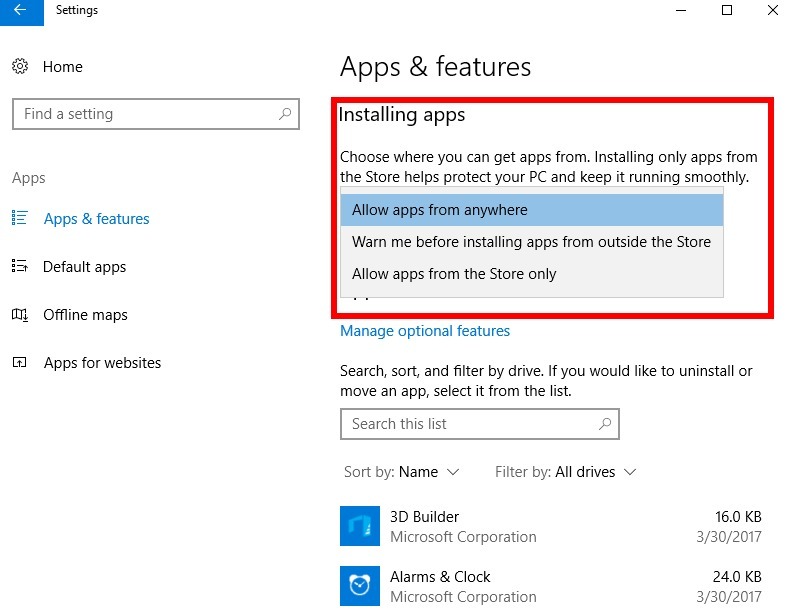 If your system is Windows 10 Pro, not Windows 10S, it has been configured to only install apps from the Windows Store - skip to Step 2 below. 1. Go to the Windows store and search for "Windows 10 Pro Upgrade". Download and install the upgrade. 2. After updgrading, reboot the computer and then open Settings by clicking the Start button, and selecting the cog icon in the lower-left corner just above the power button. Select apps & features and in the "installing apps" box change the dropdown menu to "allow apps from anywhere". 3. Shut down the computer then reboot it again. The guide will now function normally. I tried to activate the guide but it said I had already activated it. Select Support/Member Login from the menu above, enter your username and password. You'll see your username and activation key for your computer. BEFORE you junk the old computer uninstall the cruising guide from it. Enter Programs in the search box on the task bar and select Programs and Features. Scroll down the list of programs to find Cruising New Caledonia and note the version number. If it is later than 512 (month and year) click on the program and select Uninstall. The uninstall program will ask if you really want do do this. Click OK and when it is done with the unistallation process copy the uninstall code. Paste the uninstall code into the message box on the contact page. Be certain to use the same email address that you used when you purchased the guide or, if you purchased the guide from an agent, include your username in the message box. We will email you when the license is reset. We no longer support versions of the guide earlier than May 2012. If your version is earler than May 2012 you will need to purchase the latest version of the guide. If you purchased the guide after May 2012 select Support/Member Login on the menu bar and then click on Your Account/update. You will need to uninstall the cruising guide and then reinstall it. Enter Programs in the search box on the task bar and select Programs and Features. Scroll down the list of programs to find Cruising New Caledonia and note the version number. If it is later than 512 (month and year) click on the program and select Uninstall. We will email you when the license is reset and you can install and activate the guide again.